The photo above was taken by the talented Maya Dehlin. And nope. We do not have a dog. 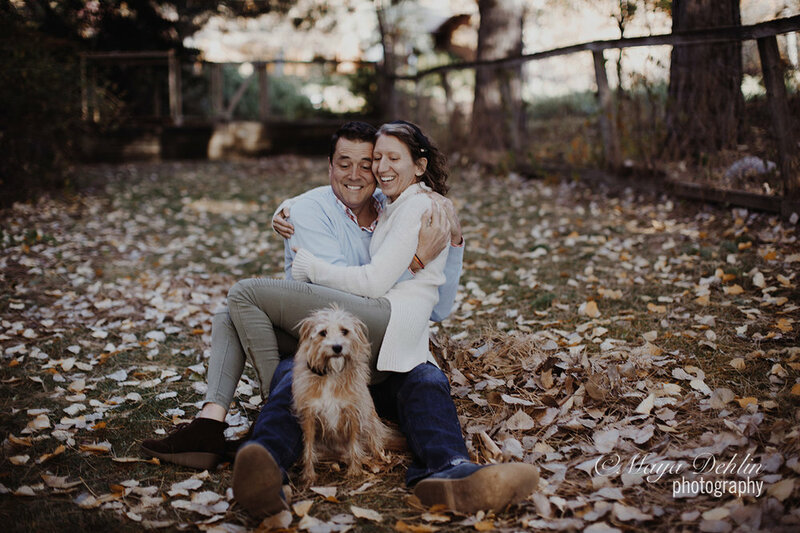 But the dog insisted on photo bombing our session--sitting so perfectly--and well, we just don't turn living things away like that. Look at those eyes! The dog needed a picture with us. Clearly. As a follow up to my last post, I thought it would be empowering to look at the five winning strategies mentioned in Terrence Real's book, The New Rules of Marriage. These strategies clearly work in most close relationships, not just in marriage. Do you use any of these strategies in your relationships? 1. Shift from Complaint to Request. Instead of beginning a conversation in complaint mode (which can escalate into an argument), consider asking for what you need. Keep your requests specific, base them on behavior, and make them achievable. If you can express appreciation as a lead into the request, all the better! "One of the great paradoxes of intimacy is that in order to have a healthy, passionate relationship, you must be willing to risk it." "You have no right to complain about not getting what you never asked for." 2. Speak with Love and Wisdom. Remember to come from a place of love. Use the repair process that consists of speaking and listening with a generous heart. Responding with a generous spirit where you clarify your partner's wishes, acknowledge what you can, and offer whatever you can. Use the feedback wheel that includes a sharing of what I saw/heard, what I made up about it, how I feel about it, and what I would like. As best you can, set aside outcome and control. "A disempowered partner is seldom generous." "Interpersonal conflicts are not resolved by eradicating differences, but by learning how to manage them." 3. Respond with generosity. Listen to understand. Acknowledge what you can. Give what you can. "The repair process is unilateral, not mutual. One partner asks for and receives help from the other in order to move out of a state of acute discontent (disharmony) back into the experience of closeness and connection. The listener must put his or her own needs aside." "No one is irrational to him/herself." "Clarify your partner's point of view. Acknowledge it. Give what you can." 4. Empower Each Other. Acknowledge the gifts the responder in the conflict has offered. Ask what you can do to help the responder deliver. Acknowledge whatever you can and give whatever you can. Practice mantras or focusing words to remind you that mutual empowerment is the goal. "I trust in your goodness and competence." "I am truly at your disposal. Tell me what I can do to help and I will." "I want you to succeed." "I am here to support you in your efforts to grow." 4. Cherish What You Have. Remember gratitude and abundance in your relationship. Give your partner specific feedback. Nourish yourself and your relationship with time and energy. Practice smart generosity. Inhabit your gifts and talents. Celebrate your growth and achievements together. "Contrary to what one might expect, progress is a source of both joy and disturbance. A shift toward increased levels of intimacy in one partner implicitly demands increased levels of vulnerability in the other, levels of vulnerability that may not be comfortable." "You cannot sustain the intimacy you enjoyed in the early stage of your relationship unless you are willing to cherish each other in some of the ways that you did at that time. You will not feel like lovers unless you are willing to behave like lovers." One of the biggest changes John and I have worked on in our relationship involves how we navigate conflict. For years we would talk to one another in a heated way, my amygdala talking directly to John's amygdala. Through our coach, Liz Dalton, we learned that we were engaged in negative intimacy patterns. What does that mean? It basically happens when the two people desperately desire closeness but their behaviors sabotage their very desire to be intimate. It is beyond tragic. John and I approach and navigate conflict in a dramatically different way now. No, we aren't perfect but we are committed. We stop when we need to. We engage in generosity. We try to embrace and honor our differences. We simply refuse to engage in conversations that disrespect or hurt the other person. Conflict happens. It is inevitable. It is all about being aware and having the right tools at your disposal. I know all too well that just because we have made progress does not mean we can relax. We must be on our game. I am so proud of how far we have come together. It hasn't been easy but our relationship continues to morph and change in ways that reflect and honor us as individuals and partners in life. What are some winning strategies that have worked in your own relationships? Are they from this list or your own? I would love to hear!